the poisoning of America's "Secret Sauce"
This book will help you connect the dots between today's economic trends and resulting challenges in a very easy-to-understand, straightforward and relatable format. Offering key strategies to boost competitiveness, Global America is an essential guide for business professionals, stock investors, journalists, educators, and students and their parents. John Manzella is an author, speaker and editor-in-chief of The Manzella Report, the premier source for global business and economic news and analysis. He's also the president of Manzella Trade Communications, a strategic communications, publishing and consulting firm, and the chair of the Upstate New York District Export Council. John has written several books on global business and contributes regularly to journals across America. His op-eds have been nationally syndicated and his views have appeared in The Wall Street Journal, New York Times, Houston Chronicle, Miami Herald, Dallas Morning News, and Denver Post. "Global America will give you a no-holds-barred view of the near and long-term effects of some of the most recent economic trends today. This book is essential reading for everyone interested in the new complex global factors and drivers of productivity and prosperity." - Barbara Osterman, Founder and Owner of Human Solutions LLC. "John Manzella presents a cogent, comprehensive picture of the emerging demographic and economic trends shaping the future of globalization and offers smart policy recommendations and business strategies for competing successfully in a rapidly changing international environment." "John Manzella has written a thought provoking book that explores the many perils that exist in the international business landscape, how they remain in a state of constant change, and reminds us how important it is to remain fluent in current affairs in order to stay a step ahead of that change. Any business person actively engaged in international business would benefit from reading this book." "Manzella's Global America is an eminently readable and realistic analysis and appraisal of America in the future global economy. While policy is never far from the main discourse, the cherry on the Sundae is his ability to single out key trends and make them meaningful to each us whether we are involved with marketing goods, managing supply chains, investing our savings, or raising our children." 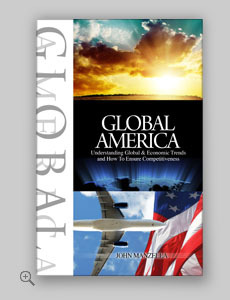 "John Manzella's book Global America is just the right antidote for the misguided belief that Americans cannot prosper in a global economy. Based on thorough research and his years of experience in global consulting, Manzella explodes myth after myth about such charged topics as immigration, NAFTA, and trade with China. His prescription of more open markets, property rights, the rule of law, and education and tax reform points to a brighter future." 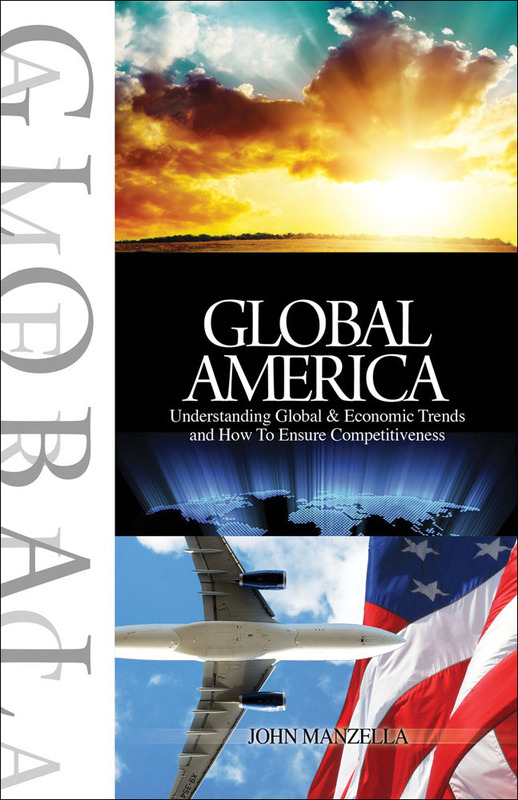 "In Global America, John does an excellent job of providing a timely snapshot of America's competitive position vis-a-vis the global economy — 15 years into the 21st century. This book provides an island of context in an all too temporal sea of tweets and spin." - Greg Sandler, President of ThinkGlobal Inc.
Manzella Trade Communications, Inc. © 2015. All rights reserved.